The opening credits feature pop-up pages in a child's book. Every child in the screening audience recognized them right away. In fact, other than the toddler who was instantly (and vocally) bored, the rug-rats seemed very involved; they were quiet and well-behaved. These opening credits, by the way, are the only time I felt the 3D was used to any special effect. It's lovely for the travelogue/story that follows, but it does NOT enhance the plot. * Neil Patrick Harris ("The Smurfs") as Patrick, the Smurfs' Number One friend who helps them when sweet little Smurfette is lured away by the evil wizard's cute henchmen. * Jayma Mays ("The Smurfs") is Grace, Patrick's wife, and mother to a four-year-old boy named Blue. * Hank Azaria ("The Smurfs") is Gargamel, the evil wizard who needs two things: 1) The Secret Formula, and 2) the "Essence" of a few Smurfs. * Brendan Gleeson ("The Guard") is Victor, Patrick's most UNwelcome step-father, who has all the finesse of a bull in a china shop. * Katy Perry (Lots of TV) is the voice for Smurfette. * An amazing Computer Generated cat. Technology wins again! 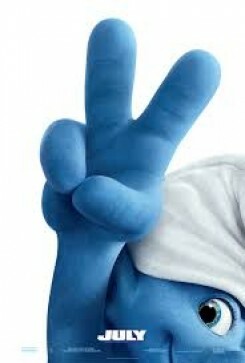 The Smurfs each have their own personalities and are portrayed by "name brand" actors. I won't go into that here, as there is nothing distinctive to note.